The 13th century song, Foweles in þe frith, is among the earliest that survive in the English language. The manuscript has two complete polyphonic voices but only one verse, and so the meaning of its nature imagery and lament for the “beste of bon and blod” has been much debated. This article places Foweles in þe frith in the context of other surviving secular songs in English; then decodes and deciphers its words and debates its various interpretations: is it a lover’s lament; sorrow for a lost animal; or a song of religious metaphor? The melody was written by the scribe in notation usually presumed to be non-mensural (non-rhythmic). I argue that the music shows rhythm, clearly written on the page according to medieval musical principles, performed in the video which begins the article. 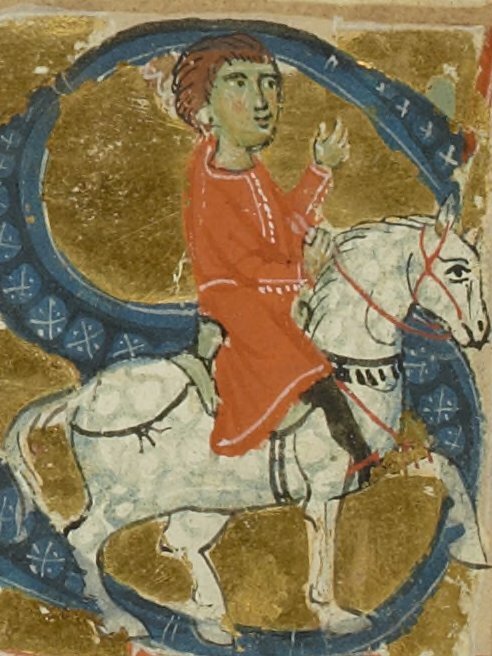 Raimbaut de Vaqueiras as depicted in a 14th century French manuscript (BnF ms. 854, f. 75v). Kalenda maya is a 12th century song by troubadour, Raimbaut de Vaqueiras, one of the southern French lyric poets and singers who developed the musical tradition of courtly love. Via Roman fertility festivals and Irish fiddle tunes, this article discusses the lyrical content of the song and the problems of interpreting the notation of Kalenda maya, penned when written music was still developing in medieval Europe. Can there be a definitive version when there are textual variants of the same song or melody? How credible are renditions of Kalenda maya that impose a musical rhythm not present on the original page? Raimbaut de Vaqueiras based the melody of Kalenda maya on an estampie dance tune he heard at court in Italy. Using principles written in 1300, I attempted to reverse engineer the sung estampie back into the tune it originally was. The reasons this proved impossible tell us something important about medieval music and the continuance of the spirit in which it was played. With a video of two interpretations of the melody played on gittern.